Lisa Randall is the author of Knocking on Heaven's Door: How Physics and Scientific Thinking Illuminate the Universe and the Modern World. She is a professor of physics at Harvard University and, in 2007, was named one of Time Magazine's "100 Most Influential People." Read an excerpt from the book. 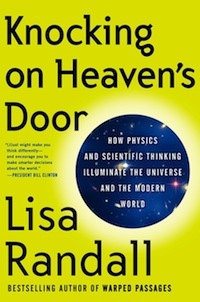 In her latest book, Knocking on Heaven's Door: How Physics and Scientific Thinking Illuminate the Universe and the Modern World, Randall writes about some of the most important scientific quests of today: the search for the Higgs boson, unraveling the mystery of dark matter and dark energy, and the possibility of discovering new physics at CERN's Large Hadron Collider. Expanding beyond this scope, though, she also presents a scientists' take on topics ranging from the recent financial crisis to the role of asymmetry in art. Lisa Randall: Firstly, I didn't want to just do what I had done in my previous book, Warped Passages: Unraveling the Mysteries of the Universe's Hidden Dimensions; I wanted to do something interesting that was different. So really the seed for the book was to go into this idea of the nature of science. I think it's an interesting story just how science is done, and I think that process tends to get oversimplified and overstated a lot of the time. Having decided to do that, I thought I should round it with actual science. So I also write about the current state of particle physics and the Large Hadron Collider. People can get so caught up in thinking, you know, this is all so abstract but I think it's important to understand that there are concrete testable results. Wired: You write that the process of science can be complicated and messy. Why do you think it's important for readers to know that? Randall: There can sometimes be this fear among laypeople: I don't understand everything in science perfectly so I just can't say anything about it. I think it's good to know that we scientists are also confused some of the time. This way we can invite others in. They can participate in understanding, and apply scientific methods to other contexts in their lives. The process of science is difficult and challenging. It involves always being aware that your ideas might be right or they might be wrong. I think it's that kind of balance that makes science so interesting. I mean, if we had all the answers already, that would be a lot less exciting as a research field. Randall: I think it was a really great example of how the process of science works. You have this solid ground that you really understand but then sometimes you find these little holes that might actually reveal whole new worlds that lie underneath. I mean, for various reasons I think this [faster-than-light neutrino] result will go away. But I don't think it was wrong to present it, and it wasn't wrong to try and find out if it was right. And what's really important to remember is that new results don't always make the old theory wrong. This is a really important and basic concept that's often misunderstood. A lot of people are very critical here. They say, "Why are you doing science if you're just going to find out it's all wrong anyway?" But that's just not how it works. Even if the results turn out to be true, it would tell us that Einstein's theory is still right over a large regime. But we would then know that there are some deeper underlying differences that apply when you do these extremely precise measurements. Usually, when a new theory is shown to be right, it simply underlies the old one, which is now an approximation. It doesn't mean we need to throw away the old theory. Randall: One example from the recent financial crisis was when bankers and economists were evaluating risk. They allowed for some variation in how the economy would grow, and maybe they even thought it could go down a little bit. But they didn't account for the possibility that it could go down by as much as it did. Now I would say it was clear that the previous decade was a bit anomalous. So you might want to allow for this variation, account for your uncertainties and then evaluate your risk within that context. Wired: Besides the title, which comes from a Bob Dylan song, you mention art a lot in the book: using examples from poetry, sculpture, painting. What is your relationship with art? Randall: I grew up in New York City. I went to museums so much as a kid, and I guess I didn't realize how much it affected me. I don't necessarily make much art myself, but after I wrote Warped Passages, I was fortunate to get involved a little in the art world. I got invited to write a libretto for what we called a projective opera, and I also got invited to curate an art exhibit. These things gave me the chance to really work collaboratively with artists and composers. We all got together to envision what the opera would look like and what the story would be. It was really an amazing experience as a physicist to go and see your words sung on a stage by amazing people. The performers were fantastic and the show, [Hypermusic Prologue: A Projective Opera in Seven Planes], premiered at the Center Pompidou in Paris. I couldn't have been luckier at having been given this opportunity. Wired: In the book you present this almost heretical idea about beauty. Scientists are often quoted saying that a true theory is always beautiful, while you say maybe, maybe not. Randall: It's funny, because beauty is framed by your experience and your tastes. While there are probably some fundamental underlying core truths that we might agree on, if a string theorist really showed you their equations, you might have a hard time appreciating it. So I wanted to bring up the point that it's not just a simple criterion, and it's very subjective in some ways. Perhaps it was part of my attempt to counter the story that science is always so pristine and beautiful. I think part of what makes the world interesting is that it's messy. I mean, part of what makes art beautiful is that symmetries are broken. So I think that's an important thing to keep in mind as we are discovering the underlying principles to the natural world. A part of the art of science is trying to find out why the world isn't quite as beautiful as we'd like it to be. Wired: A large portion of the book is devoted to the Large Hadron Collider. As a scientist, how did it feel when you first saw the machine? Randall: I was really fortunate when I first came to ATLAS [one of the six main LHC experiments]. I was being taken around by Peter Jenni and Fabiola Gianotti, who are experts on the experiment. It's not just a big machine, it's also very precise, and I got to hear the detailed stories about how precise it was and how carefully every aspect was thought through. It was really amazing. And, really, it's just big and beautiful. You can't help but want to snap pictures. I mean, the colors, the lines, it's amazingly well constructed. Wired: The LHC is poised to make many discoveries. Looking five years ahead, what would you hope has come out of the experiments? Randall: I certainly hope we'll know about the Higgs sector, which has to do with how particles acquire their mass. That was important enough that I devoted a whole chapter in the book to why we're looking for the Higgs boson, what it would tell us if we find it and what it means if we don't. 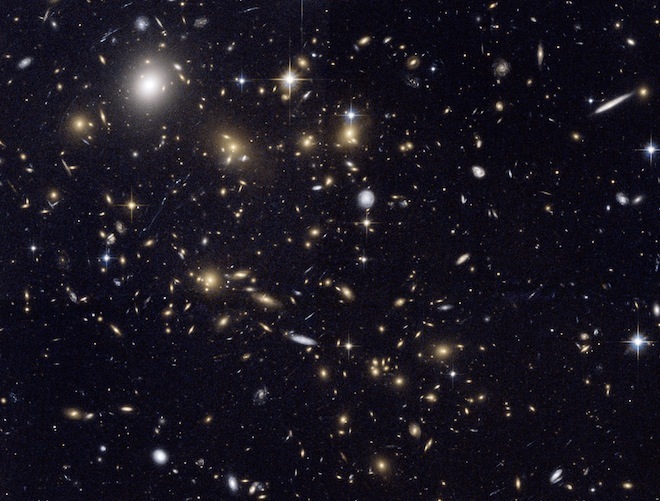 And then there are other questions about why particles have the mass they do, and that could have to do with supersymmetry, which is an extension of space-time symmetry, or it could have to do with extra dimensions. I mean, I'd like to say that in five years we would know more about all these ideas. But I'm probably not naturally the most optimistic person. I'm cautious, so I'm a little afraid that new physics might be at sufficiently high energy that it would take even more than a few years to find it. But we certainly will know more about anything at these lower energies, and ultimately I would hope that we find some evidence of supersymmetry, extra dimensions or something else that we haven't even thought of yet. Wired: What are the next frontiers in physics, the next things we might possibly have evidence of? Randall: There's this idea of warped extra dimensions, which would be an extremely exciting possibility. It's the idea that there's another universe really close to us that affects us only through gravity. It could even affect the masses of particles that we see. It has experimental consequences that we could see at the Large Hadron Collider, so it's rather exciting. Wired: What are some key things you hope people take away from your book after reading it? Randall: I hope people have a better appreciation for both science itself and why we scientists are excited about it. I want people to understand what new discoveries mean. When they see a new result in the newspaper, I want people to be able to evaluate it and see what really goes into a scientific discovery. I hope the book inspires them to approach the world a little more scientifically, and think about the role of uncertainty, the role of probability, what it means to be right and wrong; not be afraid of these things but to really understand them. When you talk about uncertainty, people tend to get confused and think you're indecisive or whatever, but I think part of making sound decisions is understanding uncertainty and risk.